One of the greatest assets of The Plaza is its organ, which has survived intact and in full working order. 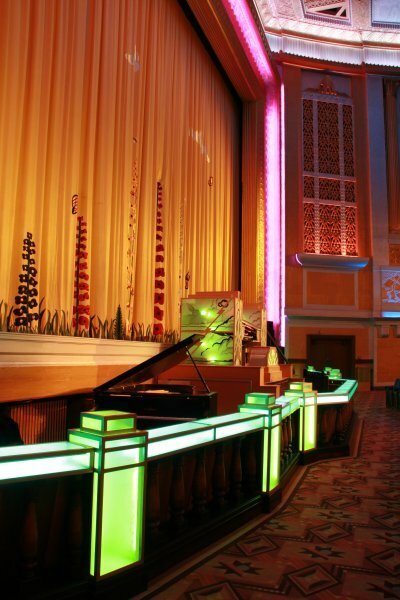 The Plaza organ was built by John Compton Organ Co. Ltd. and was the first Compton Theatre Organ to be built with sunburst decorative glass panels, illuminated in various colours. 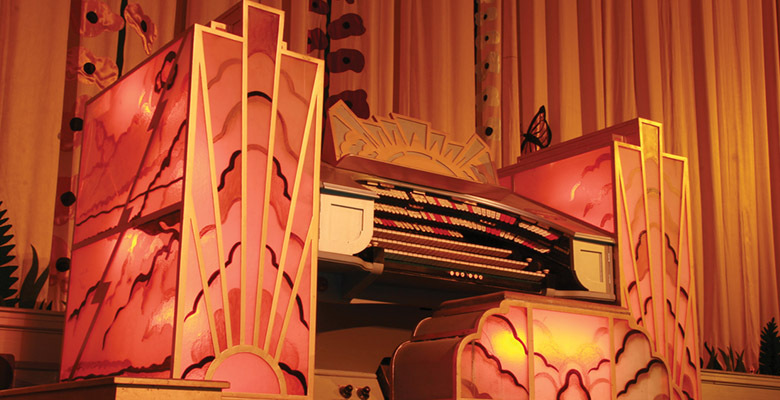 It was instruments, like The Plaza organ, that encapsulated the spirit and atmosphere of 1930’s Super Cinema. The Compton organ is a three manual instrument of special design with a unique 150 stop tab layout which was designed for the Plaza and her sister cinema the Regal in Altrincham by Norman Cocker the resident organist from Manchester Cathedral and Arthur Ward one of the original Directors of the Stockport Plaza when she was built in 1932 plus 42 toe and thumb pistons. It has 11 ranks of pipes situated in 2 chambers, one over the other, concealed behind the decorative grill in the wall to the right of the stage. There is no electric amplification, as the magnificent sound is produced straight from the organ pipes. The organist controls the volume by the swell pedals, which open and close the shutters in the grill. Positioned on a lift, the organ rises out of the floor and fills The Plaza with sound before shows, during silent movies, variety acts and musical interludes between films. Apart from the orchestral sounds of traditional instruments, the organ can supply a vast range of effects from sleigh bells to aircraft and sea sounds. The illuminated glass in the console was repaired, after it shattered when a lift cable broke in the 1960’s but the Compton has never really been out of use. Even in the bingo era, concerts were organized twice a year by The Theatre Organ Club. Recently, the Mighty Compton has taken on a new opportunities to experience the sound and aura of a theatre organ, in its original location, have almost completed vanished in Britain. However, 80 years on, the organ is still as majestic as ever and has played a major part in most events at the Plaza since it’s re-opening, attracting musicians from all over the U.K. The Compton Organ has been the star not only of many productions and film screenings but has been celebrated in live recordings for the radio and two CD’s have been created featuring the distinctive sound of this unique instrument both of which can be purchased via the merchandise section of this web site.